I spotted these waxed paper straws on the internet a few weeks ago and thought that I must have them! The seller was also selling these little glass 'milk bottles' so they came to live with us as well. 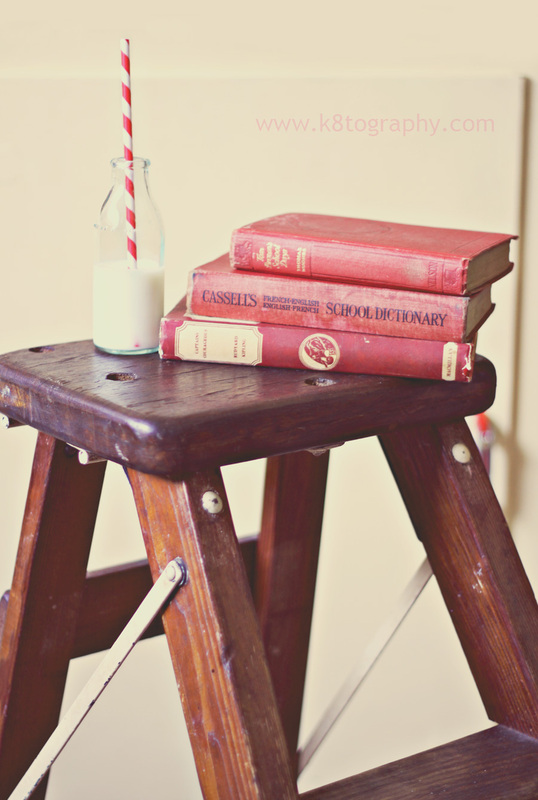 Also in this image are a couple of old books that we have in our shelves, our old steps that we have in the kitchen that is the perfect seat and my kitchen cupboards in the background with their old red handles. This image reminds me of my childhood. We had to drink plain milk out of glass bottles at primary school as part of a government initiative. More often than not, the milk was warm (as it had been sitting in the sun!) and had a big gluggy plug of cream on top. To this day, I can NOT drink plain milk. Thanks. The red and white straw is an old love of mine. I remember peeling them undone and having a lovely strip of curly paper. My 15 year old son drank the milk you see here through the straw. He was, in fact, a little surprised that you could drink liquid through paper and declared that they looked so good that they should be everywhere! I agree!